Glaring LED lights are designed on the earcups, highlighting the atmosphere of the game,Splendid ambient noise isolation. PVC wire, durable tensile effectively reduce the external resistance; Velcro cable tie, prevent the line twining. 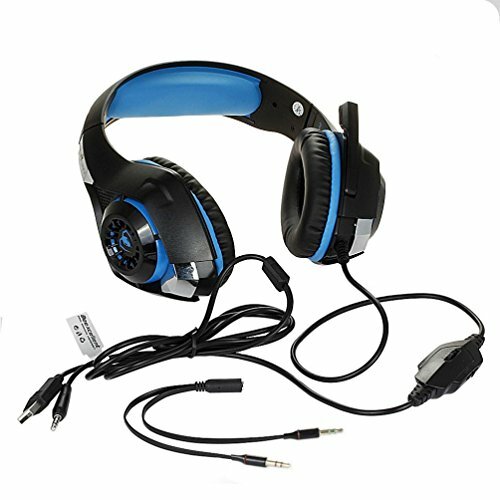 High precision 40mm driver, bring you vivid sound field, sound clarity, sound shock feeling, capable of various games. Line is equipped with a rotary volume controller, one key Mic mute, more convenient to use. 3.5mm connector, it is suitable for iPhone 6 / 6 Plus, Samsung S5, S4, LG, Xiaomi, iPad, PC, laptop, tablet, etc.